The Montana House and the Glacier National Park Conservancy are pleased to co-host another in the series of Look, Listen and Learn programs at the Montana House in Apgar Village inside Glacier National Park. 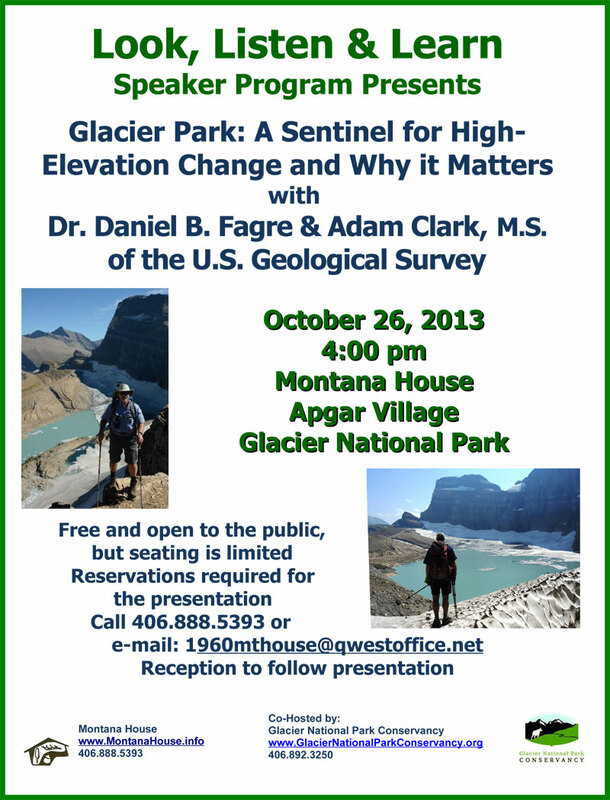 The featured presenters are Dr. Daniel B. Fagre and Adam Clark, M.S. of the U.S. Geological Survey, Northern Rocky Mountain Science Center located in Glacier National Park. The event will be at 4 p.m. Saturday afternoon, October 26th with a reception to follow. Fagre is Research Ecologist and Director of the Climate Change in Mountain Ecosystems Project for the U.S. Geological Survey, and has been doing research on the effects of climate change on Glacier National Park for the past 23 years. He is the author and co-author of three books and 150+ scientific papers that detail various aspects of mountain ecosystems and how they change. He has consulted with international organizations and served on national review committees but is most passionate about the future of the Crown of the Continent Ecosystem. Clark received his M.S. degree at the University of Montana, Department of Geosciences in 2012 with a focus on glaciology and is currently working for the U.S. Geological Survey, as a mountain guide at Mt. Rainier and as a Ski Patroller at the Whitefish Mountain Resort. The event is open to the public, but seating is limited, so reservations are needed. Please call 406-888-5393 or e-mail: 1960mthouse@qwestoffice.net for additional information and to reserve your seats. Hans and Toni Jungster established the Montana House Regional Craft Shop in 1960 in Apgar Village, just inside Glacier National Park. Their daughter, Monica and staff continue to carry on their mission: to celebrate and promote the creativity of Montana and Native American artists and craftsmen for our mutual benefit. The Montana House has been a long time avid supporter of Glacier Park and celebrated its 50th anniversary on June 26, 2010. The shop is open all year. The Glacier National Park Conservancy is the official non-profit fundraising partner for Glacier National Park, whose mission is to assure the Glacier National Park experience by providing support for preservation, education and research through philanthropy and outreach. 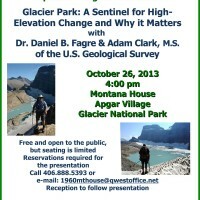 For further information, call 406-892-3250 or visit their website at www.glaciernationalparkconservancy.org.